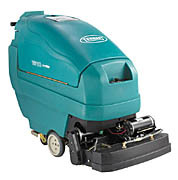 The TENNANT 1610 is a battery powered extractor. Due to the large solution and recovery tanks, the downtime between dumping and filling is greatly reduced which in turn increases productivity. The TENNANT 1610 is versatile and can be converted into a deep carpet extraction machine within minutes.